The importance of typography in a literate society can sometimes be overlooked particularly when bombarded by text in various formats from road signs, dinner menus, Facebook statuses, Instagram tags, and tweets. To stop and seriously consider the thought and finesse that goes into the design and creation of letterforms can result in a sublime appreciation of x-heights, counters, ligatures, ascenders, descenders, stems, and spines. The shapes of glyphs in writings systems often are strong cultural identifiers. Think of the uniqueness of written languages such as Cherokee, Japanese, Inuktitut, Hebrew, and Osage. These shapes play a large part in the visual expression of each of these cultures, and they help engender a sense of cultural pride and respect. Recently the importance of typography was driven home for me in a very personal way. 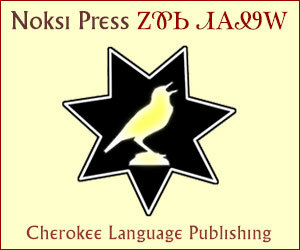 The Cherokee language is made of a unique syllabic writing system. For centuries, most Cherokees had become familiar with the typeface associated with the Cherokee printing press of the 19th century, and its shapes had become a part of our collective cultural identity. When I designed a sans serif Cherokee font and showed it to a group of Cherokee elders, the slight change to the letterforms was a shock to them, and this reaction was quite surprising to me. I described how the design would enhance readability on modern screen-based devices and fears were allayed. Despite having formally studied design in college and worked as a graphic designer professionally, I had never experienced type’s true power in such a visceral way. The power of typography lies in more than simply stating information. It is a direct reflector of social and cultural identity. So with the huge array of beautiful fonts available to users, why do people choose some of the most horrid ones? Enter Papyrus. You know this font even if you aren’t familiar with the name. You’ve seen it used for things such as the titles natural health remedy books, the packages of organic hand soaps, and tacky birthday cards. The font was designed by Chris Costello for Letraset in 1983. Its design of rough-hewn edges recalls ancient script written with a quill. There is nothing inherently wrong with such a rustic design idea, and in some regard, it is a sign of inspired imagination to recall the Egyptian civilization. Papyrus as a writing surface was a major development for visual communications. It was made from the Cyperus papyrus plant, and a complex process was engaged to produce the substrate that involved cutting, soaking, pressing, and drying the plant. Knowledge, then as now, is power, and the Egyptian scribes who wrote on papyrus wielded much influence. Papyrus as a font seems to have been informed by a lofty history. But whatever Mr. Costello’s intentions for the font’s design, it has since become a negative element in Indian Country. The font has taken on the identity of a let’s-get-back-to-nature vibe embraced by New Agers and hippies—the very same sorts of groups that are notorious for perpetuation of tired pan-Indian tropes. Papyrus has become an oft-used font for anything Indigenous. The book you saw at the gift shop that helps you find your Native genealogy? The title is in Papyrus. Or what about the t-shirt with the generic buckskin Indian maiden idling by the stream? That “Native Pride” text across the chest is more than likely written in Papyrus. What about the flyer for the big powwow this weekend? Chances are “Indian Tacos” is emblazoned on it somewhere in Papyrus. An announcement for a public forum with a councilperson? The date and times are in Papyrus. I could list endless graphic materials made for Native design projects that utilize the Papyrus font. Not only do the New Agers that latch onto Indigeneity—and all the gag-inducing stereotypes they attach to it—use this font when designing flyers, brochures, books, and websites about Natives, there are also many Natives who use this font as well. I could easily populate this article with egregious sample images I come across quite regularly, but I want to keep my friends, even the ones who use Papyrus, so this column should be viewed as a public service announcement about bad design. A superficial glance may not reveal anything harmful about one’s choice of font. As long as one communicates the message, the mission is accomplished, right? We may know when and where the powwow is this weekend because of the flyer we saw, for example. But harm comes from the symbolism of Papyrus being tied to ideas such as nature and ancientness. It paints us as noble mystic savages while forcing us to continually live as relics of the past. These are the same ideas used throughout history to subvert us as people in attempts to destroy our cultures, languages, and land bases. It belittles our standing as vibrant, 21st-century people with strong cultures. The fact that we have embraced an action such as graphic design speaks volumes about the true nature of how we exist in a contemporary context. Our choice to create communicative materials such as posters, flyers, t-shirts, newsletters, stickers, and websites means that we must be aware of the design elements of our content. We must be sensitive to the symbolism of such elements like color, pattern, and even direction when designing materials. And the handling of typography is perhaps one of the most important because it is the information that conveys the most direct information. Regardless if your language has its own writing system and fonts, such as Cherokee and Inuktitut, or if it doesn’t, choosing typefaces that reflect your intended audience’s values will strengthen its impact. The next time you’re tasked with a design project, whether it’s a complex branding identity system, film subtitles (remember Avatar? ), or a flyer for the next tribal benefit singing, remember that a mouse click or finger tap to select your font is making a much larger statement than you may expect. It is your contribution to the reframing of the presentation and discussion of Native people. Choose an elegant font for your people. Or make your own font. Make your choice anything but Papyrus. Thanks for this intriguing warning. I should love to know just WHAT to avoid – you gave no examples of this offensive font – please send my an example. Currently I am preparing a lecture on Mayan botany, and encounter many Mayan glyphs, though fortunately the Maya had no alphabet (before Bishop da Landa taught them the Latin alphabet), so they could have no font. I praise your enterprise; my grandfather was a printer, and when young I was familiarized with the traditional fonts used in their lead characters, whose design had to meet many tight criteria. Please sent examples of this dreadful “papyrus” font. Nice try, Martin Sturge, at tricking us into showing the Papyrus font 🙂 We’ve been Papyrus-free since 2013, but for your viewing pleasure, Good Sir, may we introduce you to Comic Papyrus?